Mary Beth Breshears speaks at her exhibit featuring photographs from her relief trip to Puerto Rico. A year ago, Hurricane Maria laid waste to Puerto Rico. The hurricane caused a reported 2,975 deaths and a mass exodus of residents. An Illinois State master’s student in art education spent part of the summer break helping a community on the island rebuild. Mary Beth Breshears traveled to Puerto Rico in May with 10 other volunteers. 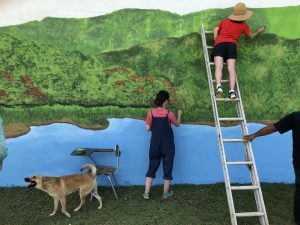 They stayed there for nine days pouring concrete, cutting rebar, painting murals, and planting gardens, in an effort to restore Patillas, a town of 17,000 residents along the southern coast of Puerto Rico. Though she arrived eight months after the hurricane, Breshears saw widespread destruction, including twisted metal and damaged trees. Helping Puerto Ricans was a cause near and dear to Breshears. Her mother is from Puerto Rico, and Mary Beth still has family on the island. Breshears and the other volunteers weren’t sure what to prepare for when traveling to Puerto Rico. During their stay, they bunked in a United Methodist women’s camp with no hot water, no air conditioning, and no Wi-Fi. Her trip was supported by a grant from the Friends of the Arts. With the funding, she bought art supplies that she and community members used to create murals throughout the town. One mural was of Lake Patillas. Breshears left her art supplies with the people of Patillas and plans to visit the community within the year to see how the works have progressed. 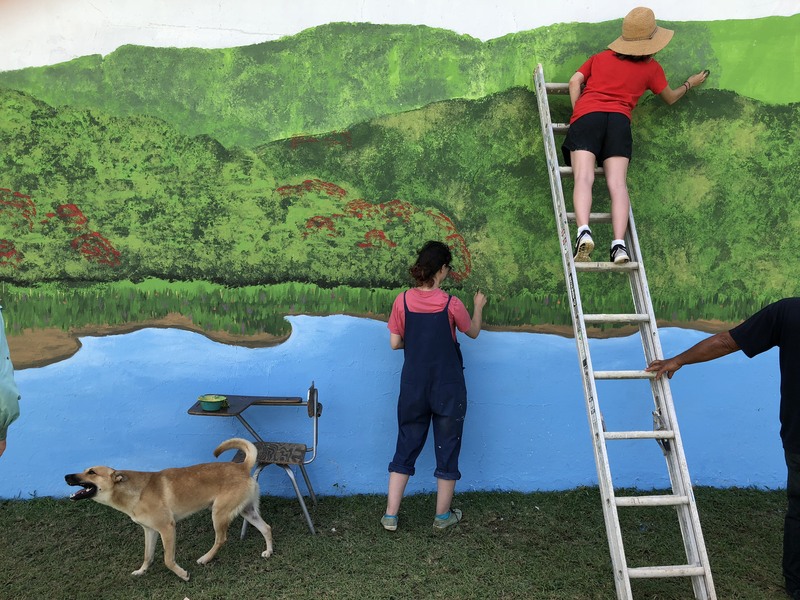 Mary Beth Breshears works on a mural in Patillas. Between painting murals and putting up drywall, Breshears photographed volunteers and community members as they came together to rebuild two houses and restore the town. Those photographs, collected in the exhibit Puerto Rico: Reinforcing a Sense of Place Through Art After the Hurricane, are on display through September 30 on the second floor of Milner Library. Great article!! I would love to shake the hand of the fine woman who wrote it!